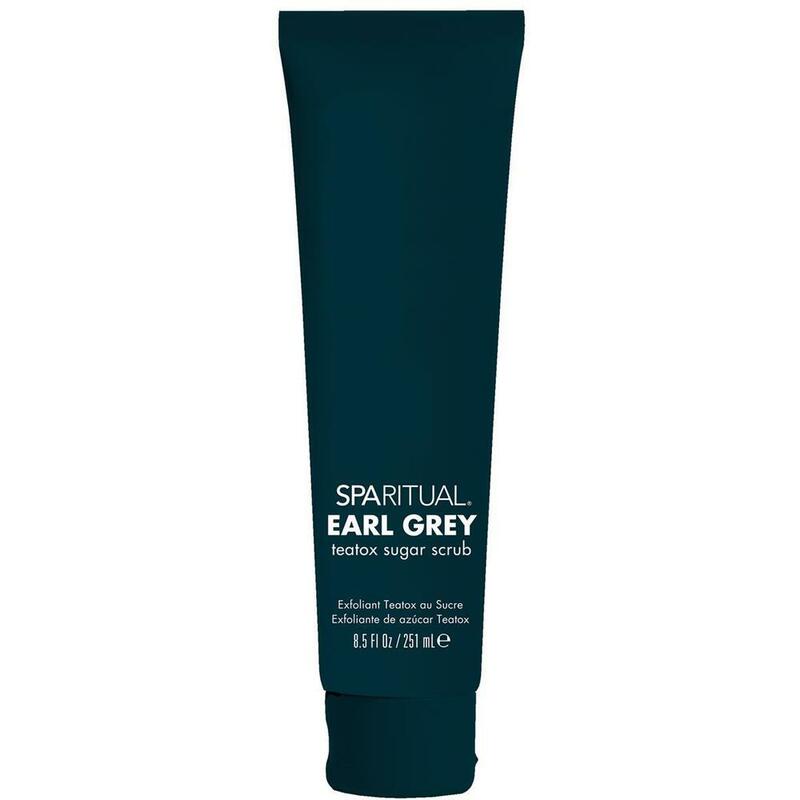 SpaRitual Earl Grey Teatox Sugar Scrub Exfoliant | Purifies and Hydrates Skin 8.5 oz. SpaRitual Earl Grey Teatox Sugar Scrub Exfoliant | Purifies and Hydrates Skin / 8.5 oz. Ultra gentle SpaRitual Earl Grey Teatox™ Sugar Scrub purifies and hydrates skin for a radiant glow. Contains organic extracts of black tea, marigold, and bergamot and orange essential oils. This black scrub is 100% vegan, 100% nature derived, and 75% certified organic. 8.5 fl. oz. While in the shower, gently massage onto hands, feet, and body in a circular motion to exfoliate skin, concentrating on rougher, drier areas, such as elbows and knees, and rinse thoroughly with warm water. Use daily in the shower to help soften heels of the feet. Organic Black Tea Extract: antioxidant (polyphenols); slows aging, soothes, and reduces inflammation. Organic Marigold Extract: antioxidant (flavonoids); soothes, reduces inflammation, irritation, and promotes healing. Organic Bergamot Essential Oil: antioxidant (polyphenols); helps reduce anxiety and lift mood, relaxes muscles and reduces soreness. Organic Orange Essential Oil: antioxidant (Vitamin C); reduces inflammation and slows aging. Earl Grey Essential Oil Blend: Clary Sage essential oil (top note), Bergamot essential oil (mid-top note), Southern Cone Marigold essential oil (mid-base note) and Alpine Hay essential oil (base note).